This is the most popular size LED bulb for upgrading your existing 10 watt halogen light fixtures to LED. In other words, it fits into most fixtures and provides ample light. These 12 Volt LED light bulbs feature new technology which combines enhanced light output with reduced energy consumption. Replaces bi pin halogen or xenon bulbs found in rv lights or boat lights. Operates on 12 volts DC or 24 volts DC (acceptable voltage range is 10vdc to 30vdc). I replaced the halogens in 35 fixtures with these. It was a lot of work but the amp draw is drastically lower now, and they are very bright. Most halogen dimmers are not modulated (or PWM) which is what is generally needed to fully operate the LED (electronic) dimmer function. We have found that in approx. 80% of the retrofits the customer is okay with the marginal dimming without changing the dimmer. In approx. 20% of the retrofits the switch that operates the fixtures may have some internal carbonization which can really reduce the dimming performance. 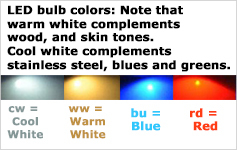 One of our RV dealers has told us he has found our bulbs out perform any other LED bulbs he has tried and even in this situation they perform the best. Before changing out the dimmer we can recommend 2 things to try -- 1) If there are 8 lights in a circuit - make sure all 8 are changed to the LED (as opposed to having some of the old bulbs still on the circuit). 2) Try changing the switch - a new switch may have a cleaner contact and better performance. If there is the space in your switch box we recommend using EF1206 dimmer (check to see if there is depth to accommodate- note the EF1206 can operate approx. 60 watts at 12v dc or 120 watts at 24v dc or 5 amps max). This LED bulb will fit numerous 12 volt Light Fixtures with "sideways mounted" sockets, so you can easily upgrade them to LED.